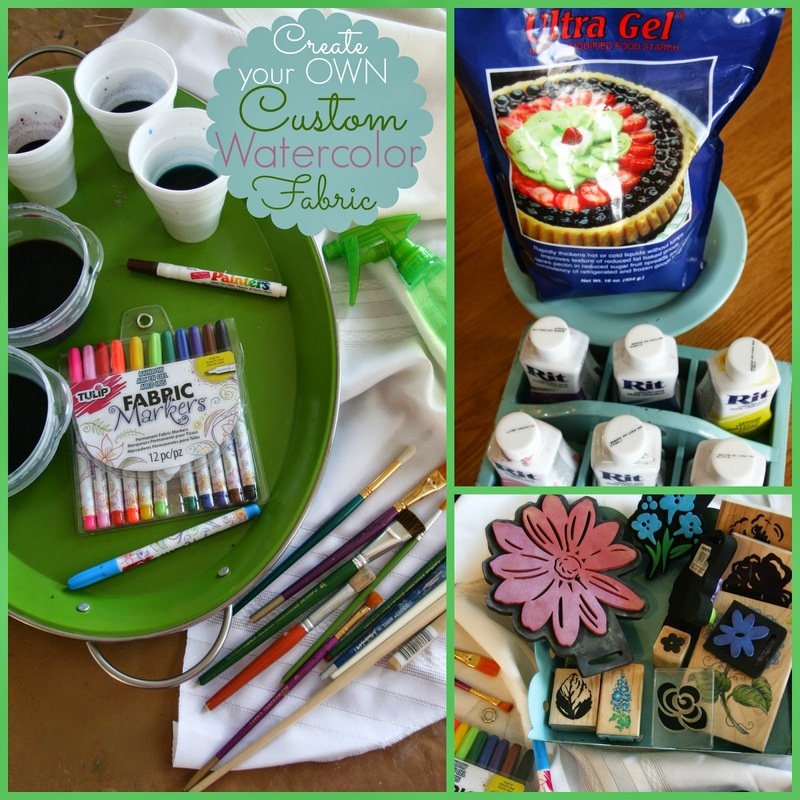 Are you ready for some creative FUN?? Would you like to try a technique that will have you hooked within minutes? Do you love beautiful watercolors? Do you enjoy creating things for your home? Does the sample above look like I painted it on my own? I have a secret...I didn't "HAND-paint" it, But I "Semi-Handmade" it! How did I do that? 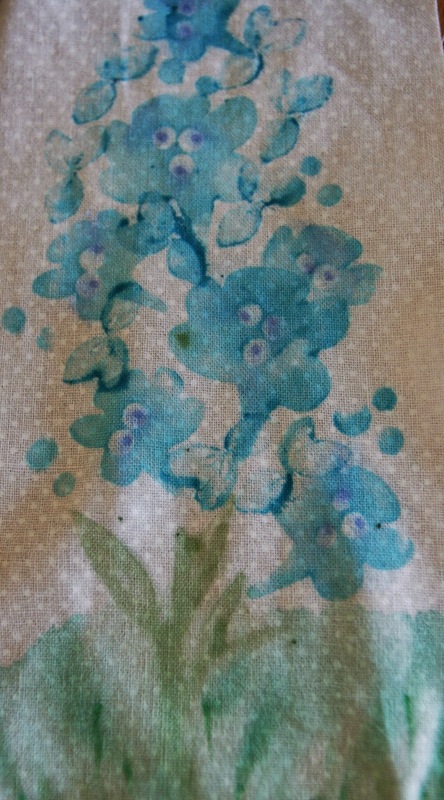 By using Rubber Stamps, some special brushes, and a very unique formulation of "gel ink" that I created while experimenting with this watercolor painting on fabric technique. So now I'm going to teach you how you can do the same thing. And you are going to LOVE the results. I'm not going to say it's "Fool-proof", because it's not. You will never receive the exact same results I attained because your fabric, dying and painting mediums and technique are all going to vary from mine. But that's the FUN part! I want to inspire you to try your hand at this technique and create your own beautiful pieces of art! I have to say that I can't draw to save my life...I run for the hills if someone says "Pictionary"! BUT, I love to paint, and I especially love to paint with watercolors, as long as I have stamped something down, or I have a printed image. This is what I hope to share with those of you that think you can't paint....YOU CAN!! If I can do it, you can too!! Are you excited to get started?? Let's do it! But first....Here are some photos of my creations for some inspiration and ideas. Please be thinking about what YOU want to create as you look through them. I'm not giving exact recipes or instructions for any particular design that I did...just guidelines! Now this is your starting point before you begin any design, and I really want you to think about what you want your final product to look like because different blends and types of fabric will give you different results. I used all white for my samples...this is not necessary, but you can imagine how some colors will not give a true result if your base is not a light neutral. (I plan to create some other designs with a different colored base, but right now I don't have them to show you, so you're going to have to wing it!) The main thing to keep in mind is to buy some EXTRA of your fabric to practice and experiment on before you dive into your project. Trust me when I say you will thank me if you follow this advice! Fabric content: 100% cotton will hold the dye best. 100% polyester bleeds the most. 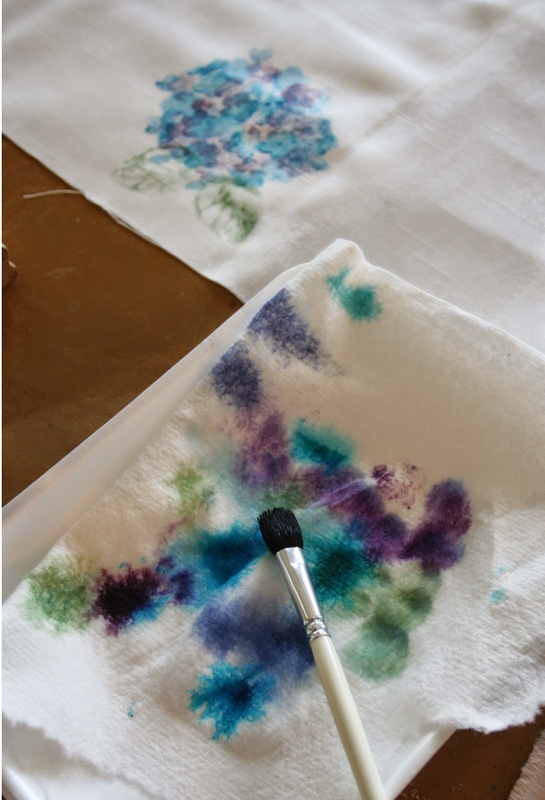 If you're going for a very loose watercolor in your finished look, you'll want a polyester or poly-blend. Also keep in mind that pre-washing your fabric will have an effect on the way the water reacts because the "sizing" (a new fabric coating) will be removed by the detergent. Fabric structure: Most fabrics have a right and wrong side. In this technique, the wrong side might actually be your favorite side to work on, but you won't know unless you buy extra to practice on. Also, some fabrics have a very tight weave, while others are a very loose weave. This will most certainly impact the way that your fabric takes the ink and the design, so be aware of that when you make your purchase (or pull something from your fabric stash if you're like me). So here's the thing: I didn't try this with any fabric paint yet (OR paint with Fabric/Textile Medium mixed in). I plan to at some point as I keep creating with this technique on fabric, but I haven't yet. I do know from my own experience that paint is going to be stiffer, less opaque and less fluid. I will thin it down, but that will change the pigmentation. As well, it will also have a different viscosity than the main product I used, which is Rit Dye (Keep reading through the whole tutorial for my tips on how to make it color fast if you plan to wash your project upon completion). 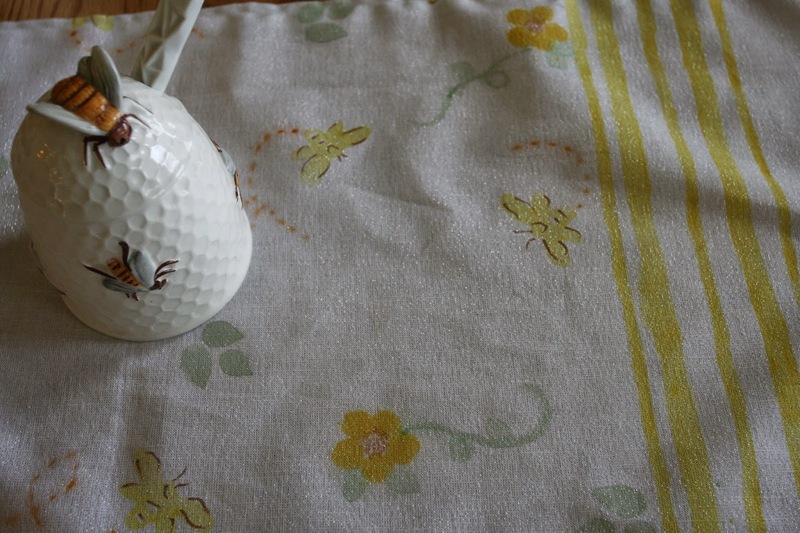 As I started my projects, I began with a basic "Color-Wash"/Striation technique that involved laying down the paint, with a brush, onto the fabric. On some of my test samples, I sprayed the finish after I got all the paint down. On some, I wet the fabric first before applying the paint. On some, I let one color dry before I added a second color. In all, I tried about 10 different ways of application, on about 3 different types of fabric. On some, I hung the fabric over a table edge so that the pattern would draw more downward instead of spreading out on a flat surface. I spent about 2 hours doing all this, and allowing for drying time in between, and I learned a lot along the way! One of the things I learned is that every fabric behaved differently...which I why I said at the beginning to buy extra fabric to experiment with! This next tip is the BEST part of what I want to share today, AND it's the thing I was most excited about discovering as I was working on my projects! THIS TIP IS LIFE-CHANGING, PEOPLE. So you're probably wondering why I would use a kitchen cooking product in my craft project, right? Well, this is what happened. I decided upon completing the striation painting that I really wanted some hydrangeas in the middle of my runner. I have a beautiful Hydrangea blossom rubber stamp that I had planned to use , but I didn't like the way it turned out in my practice stage. So I went digging through my millions of rubber stamps (I'm fully not kidding about that amount, either. Well, it may not be a full million, but I'm definitely in the upper thousands) for a stamp that I could use to create my own blossom design. I found a good one! It wasn't an exact match for hydrangeas because they have 4 petals per little flower, and not 5 like my stamp, but it worked...and I use a 3 petal pointed one to make up the difference and extend the edges (See photos). I also found a leaf stamp that was perfect. I'm totally in love with the end result. Another product that I used for accenting as well as base coloring are the "Fabric Pens". The ones I used are from Plaid, but other brands make them as well. I LOVED these because of their fine tip....they were perfect for what I used them for. I will get lots of use out of these. I also used them to add the brown seed centers to the daisies, as well as some of the centers of the hydrangea blossoms, and I used both light green and dark blue on those. Additionally, I added the brown details to my bees on the yellow runner. 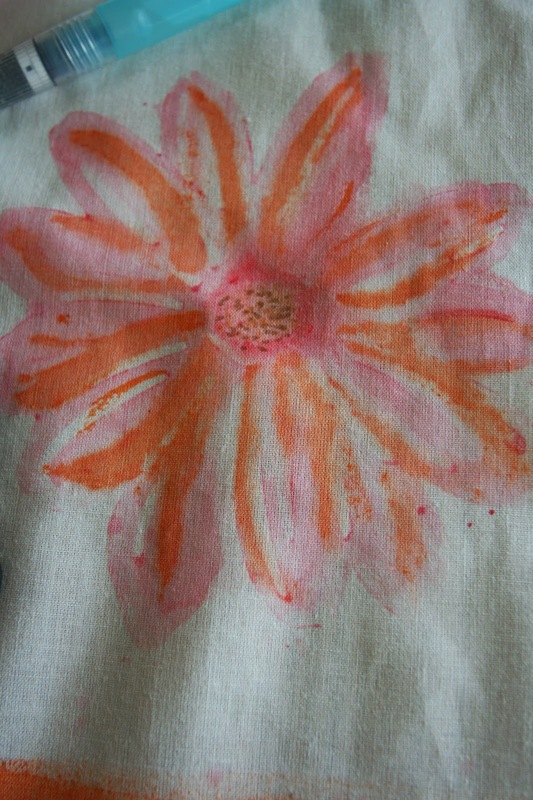 ~Drawn details with the dark pink fabric pen, on top of the water brushing I did for the salmon paint. The water helped to "dilute" the sharp lines of the paint pen, and "blended" the ink into the rest of the design. Are you wanting to make your design colorfast? 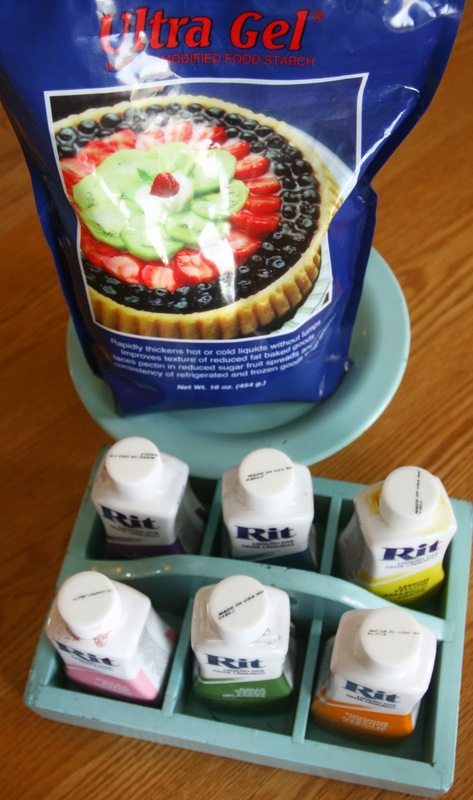 I did some research and discovered that Rit Dye, as well as some others, set with HOT WATER. Other brands will set by heat, like with an iron or a dryer. I did read something that said you can put the project into a tightly sealed plastic bag and then put it in the microwave, which will then produce a hot steam that will help to "set" the color into the fabric. I will try this on some future projects, and when I do, I'll post my results here. It's my opinion (though not tested yet) that the application of Ultra Gel won't affect the final outcome if you choose to heat set your project. It's simply a starch, and it shouldn't affect the washing capabilities in regards to the way the color embeds in the fabric. But, as I've said, I haven't tested washing anything yet, and when I do, I'll let you know! 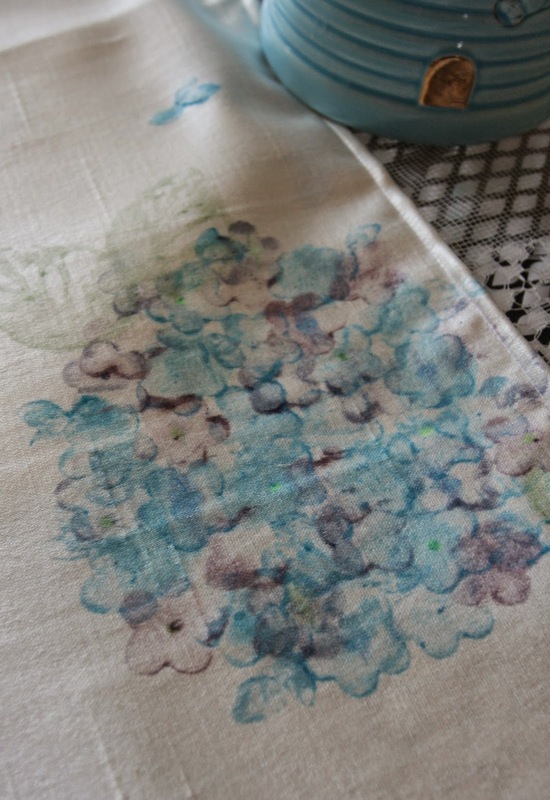 TIP: Rit Dye is highly stain-able!! Protect your surface and clothes and take caution if doing this with kids! In all honesty, I used a huge variety of brushes in my experimentation, and one of my favorites is essentially a thick make-up brush (like for eye shadow)...It held the thickened dye really well. Other than that, the flat head brushes were my favorite to apply both to the stamps, as well as directly to the fabric. I often see those in packs with a variety of sizes for a great price at craft stores and even Walmart. Other than regular brushes, my favorite way to do this technique is by using a "Water Brush". You can find these in the scrapbook section of the craft store. 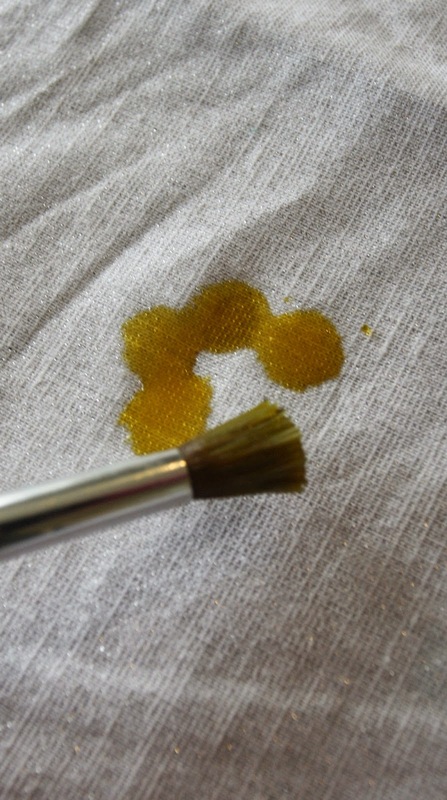 You simply pop out the insert and fill the handle reservoir with fresh water, and then squeeze it out of the brush tip. It's a pretty awesome tool and not expensive. As you can see, I used both wood mounted stamps as well as fun-foam stamps. Fun foam stamps are SUPER economical...usually about $1 per stamp. Either type works, but keep in mind that the more un-cut space in the stamp design, the better. A flat surface with minimal details will work the very best, in my experience. But remember....EXPERIMENT! 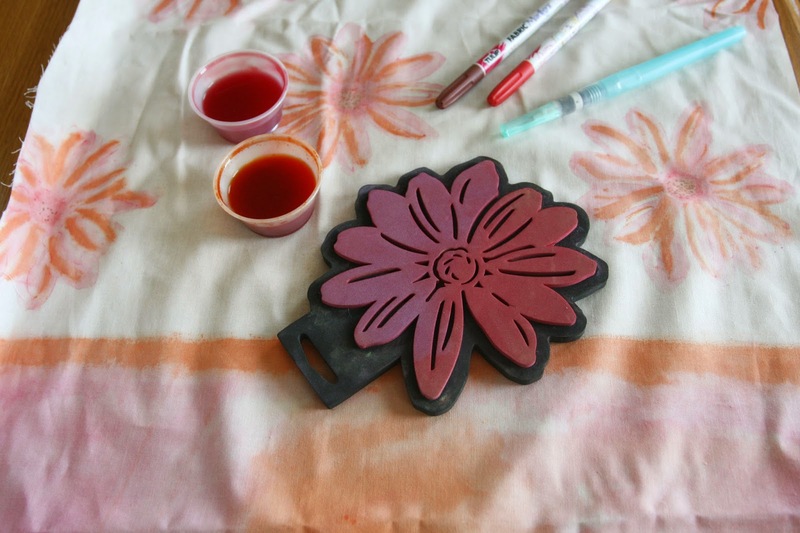 Another nice thing that you can do is only paint the dye onto a portion of your stamp to create a different look. Here's an example below that I created on some Swiss Dot fabric. 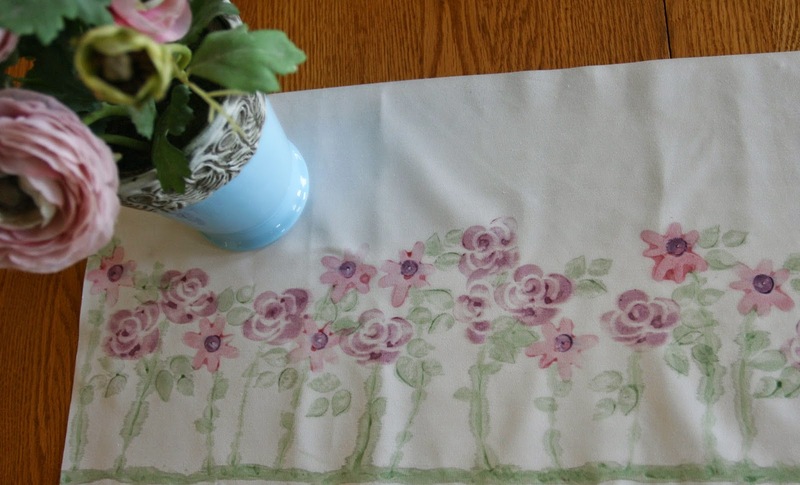 I plan to make placemats with this design using the window blackout fabric that I used on the purple/pink rose design as well. 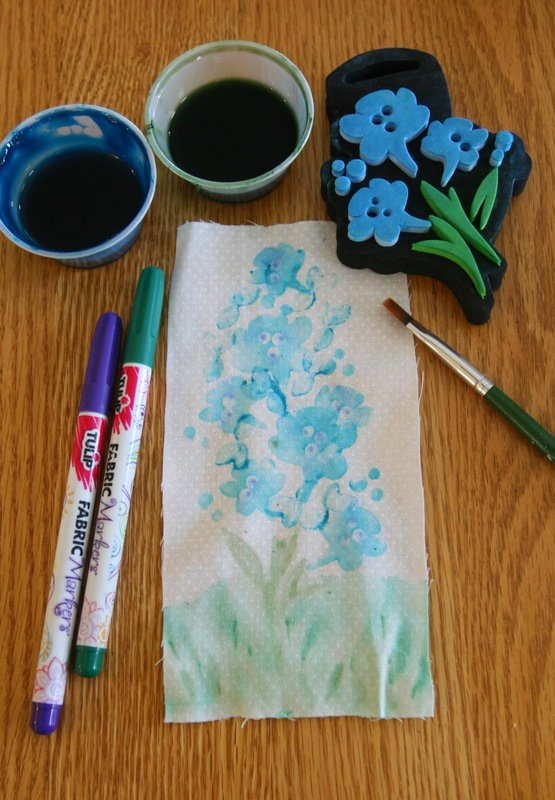 So you can see how I painted ink onto only a portion of the stamp to continue the design and ended up with a Delphinium even though the original stamp design was more of a posy. I then added dots to the centers with a purple pen. I created a grass "base" with thin green dye, and added some pieces of grass with the green pen. The extra liquid from the thin base allowed the green paint pen to blend. 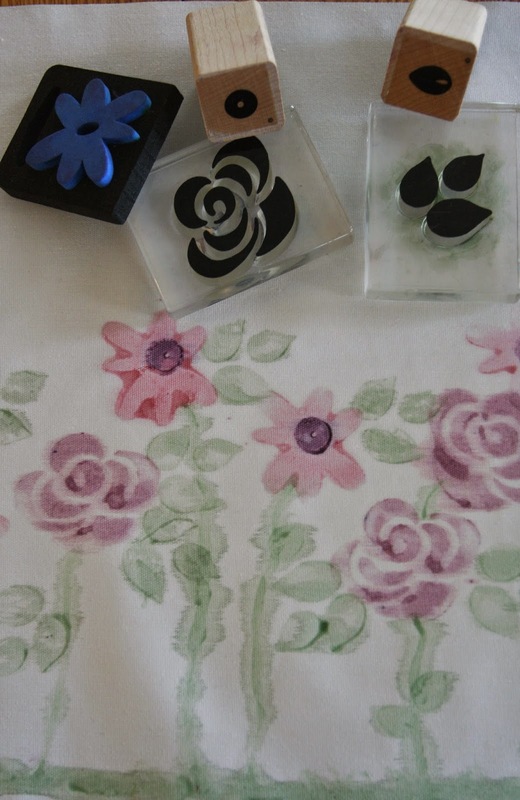 Here's what I used for this pink/purple rose design as shown below. 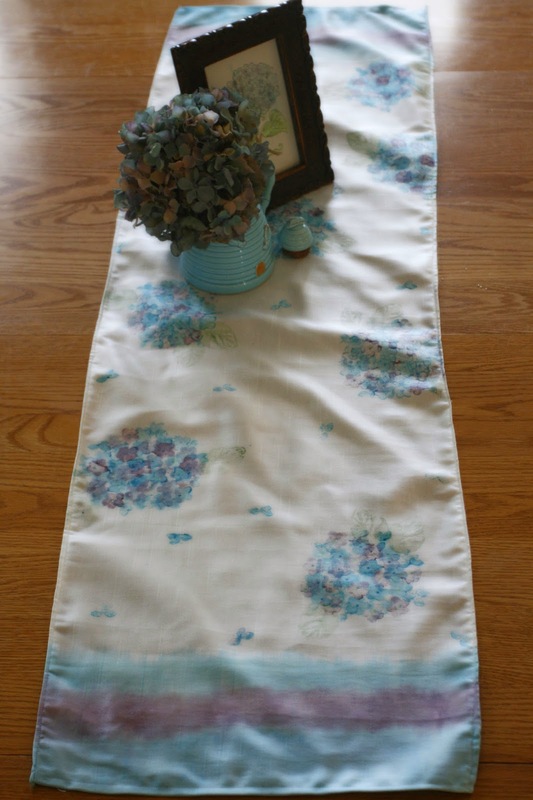 As a note, I used a remnant of "Room Darkening" Fabric to create this one at the last minute. I'm not kidding...it took me 10 minutes to make this design! I combined stamping with freehand painting. See how much the stems spread out? I didn't add extra water. This was thick dye, and I used the very same paint on the "grass" at the bottom. What's the difference? The fabric itself! If I'd have it turned the other way, the stems would have stayed in line, and the grass would have spread, which would have been better! But hey, this was for fun and I still like how it turned out....and I learned something to teach YOU, my readers! 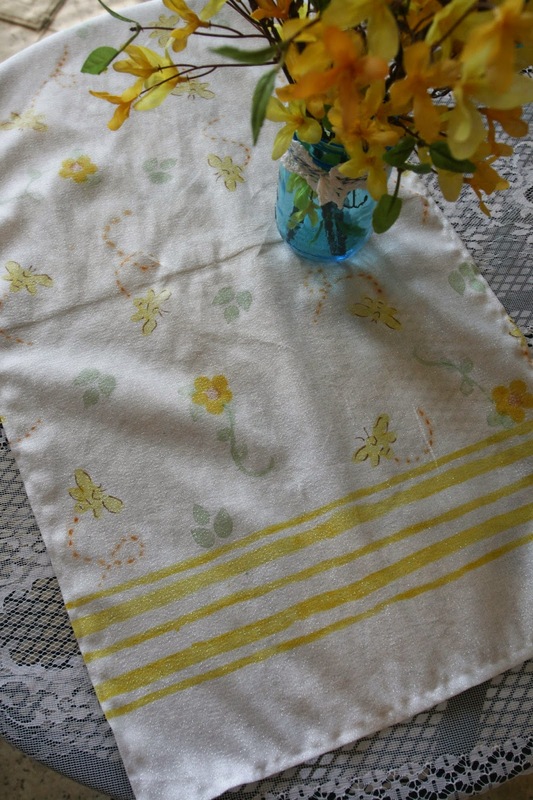 I'm going to get more of this fabric to use for placemats because it is thick and wipe-able, and then I'm going to do the Delphimium design that I did the sample of above. ~Absorbent Paper Towels...I LOVE "Viva" brand. Make sure to wipe the area below your project while you are in the process of painting...you don't want the paint/water underneath to spread to another part of your project unexpectedly! ~Plastic to protect your work surface. 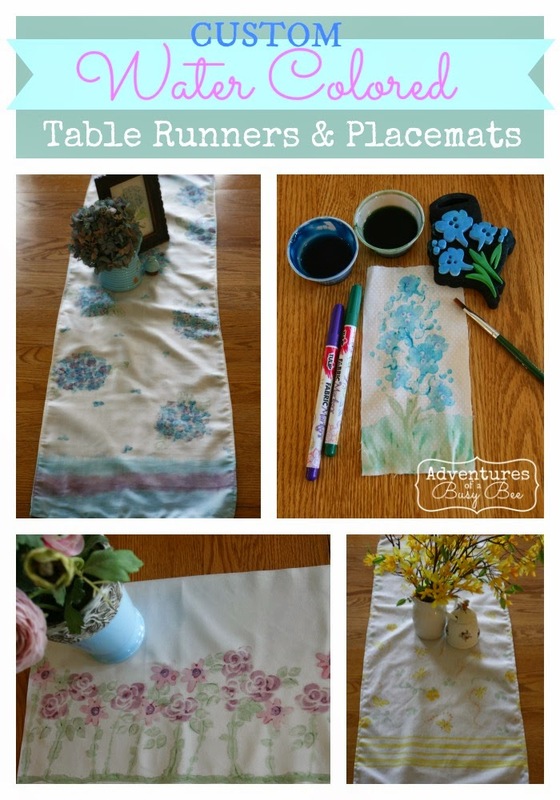 If you are doing the striation technique and letting your fabric drain down, make sure the area underneath your table is protected with plastic as well! ~Pencil and good WHITE art eraser...in case you want to mark placement for stamping/design on your project. If you'd like to see the video segment, here it is! I think there are MANY applications for this technique, don't you? Think Pillows, curtains, clothes, accessories, etc! I will be trying out a few things because I am totally HOOKED on this technique! I really hope you will try out this technique! It is so much fun! Share your ideas, questions, inspiration and success with me here....I'd love to hear about your own experiments & results! This is so pretty Emily! I have never heard of Ultra Gel. I love tinkering with watercolors. Will be back to watch the video. Thanks for sharing with SYC.